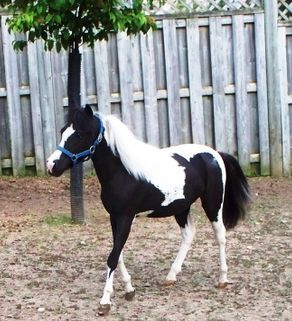 This filly is tested to be homozygous for tobiano. Dawna is a very friendly horse by nature, and has gone to a new home. Xpress in color! This little fellow is the spitting image of his daddy only with lots of color! Reyna is the friendliest little horse that can be found. Children can lead her and she is willing to please. Attitude and conformation all in one package with the bonus of unusual primitive color! Another beautiful filly from Ritz! Suetta is full of energy and has a lot of pride in herself. This girl is a full sister to Banjo and to Sweetdream's Sugar & Spice. Regretfully I have sold this beauty. Starbuck has a quiet temperament,has confirmation, color, all in one package. This fellow has gone to a show home and has many titles. WOW! Ritz and Extra have truly outdone themselves this time!!! 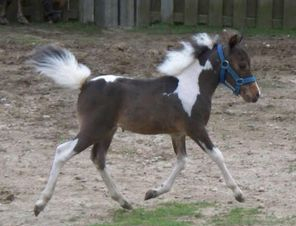 Baby doll head, long legs, upheaded, great topline and COLOUR!!! Beautiful blue eyes and is homozygous at that. Kristie is another one of these WOW fillies that would open the judges eyes. This girl has the paw prints which convinces me she is homozygous just like her dad and has this true black color. Both her parents have great titles, Ritz is multiple Champion and Kahlua is HOF in halter. 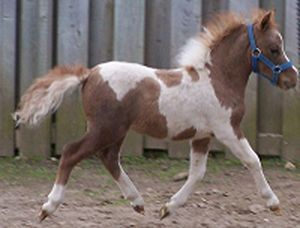 This well put together little filly is a miniature draft horse. Has the color of a Belgian and she thinks she is one. 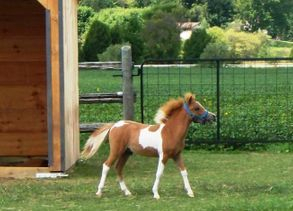 With those flashy white legs she will look sharp in harness and is sturdy enough to do some pulling. Very friendly and outgoing, always ready to meet people - Why???? Because we spoil her! Gone to a new home. 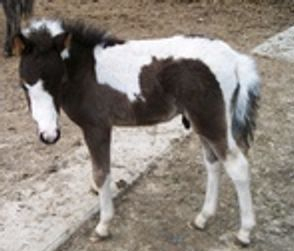 Starburst is a zesty little boy with colour and attitude. His mother is a chocolate pinto, and his dad is a blue roan appy and Star is coming out with dark appy spots and roaning out. Ah!!! What colour! This refined boy with his blue eyes, colour to burn and great conformation, speaks for himself..... I want in the the show ring ... LOOK at me! This handsome little fella has been sold to a wonderful new home! Emily.... well she has it all!! Color , conformation,and a lovely temperament. 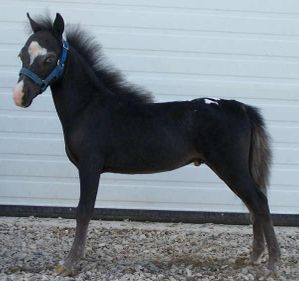 This well bred filly will be an asset to someone's herd and won't let you down. The Buckaroo attitude is shining through and saying SHOW ME!